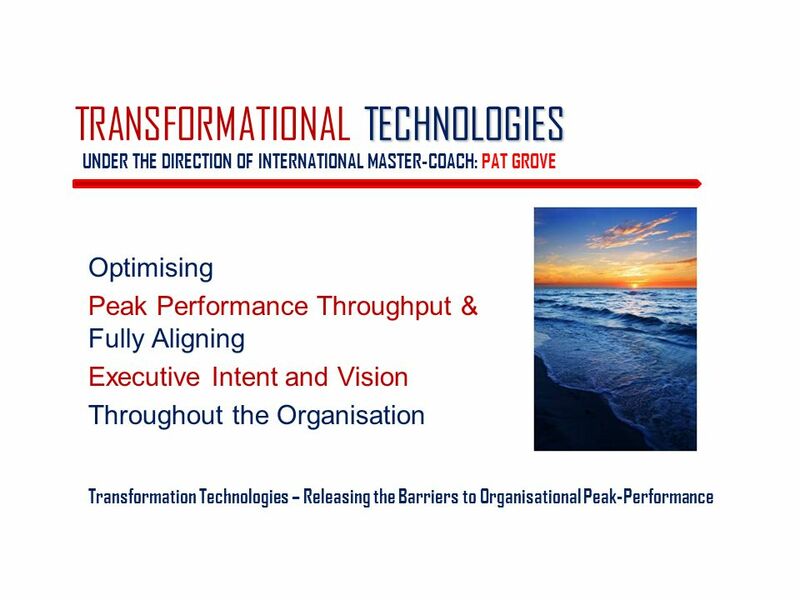 TECHNOLOGIES TRANSFORMATIONAL TECHNOLOGIES UNDER THE DIRECTION OF INTERNATIONAL MASTER-COACH: PAT GROVE Optimising Peak Performance Throughput & Fully. 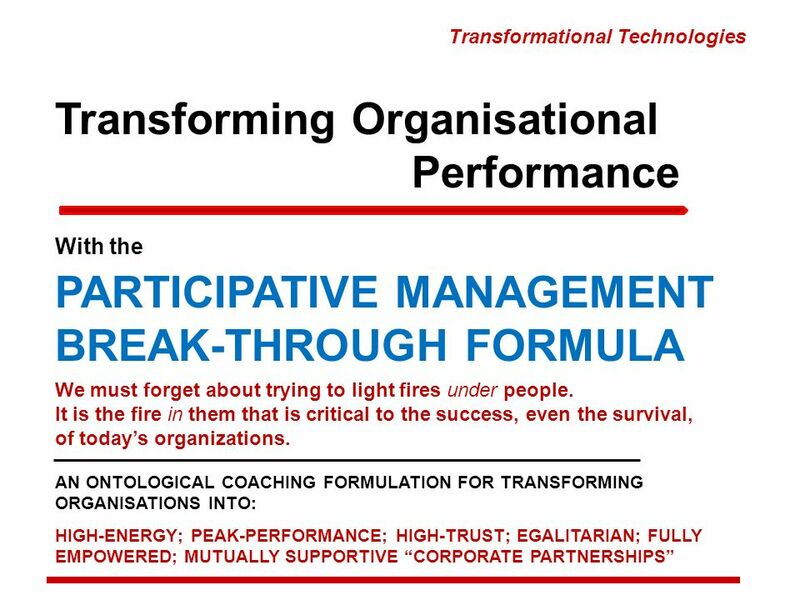 2 Transforming Organisational Performance AN ONTOLOGICAL COACHING FORMULATION FOR TRANSFORMING ORGANISATIONS INTO: HIGH-ENERGY; PEAK-PERFORMANCE; HIGH-TRUST; EGALITARIAN; FULLY EMPOWERED; MUTUALLY SUPPORTIVE CORPORATE PARTNERSHIPS With the PARTICIPATIVE MANAGEMENT BREAK-THROUGH FORMULA Transformational Technologies We must forget about trying to light fires under people. It is the fire in them that is critical to the success, even the survival, of todays organizations. 4 Whats Missing? 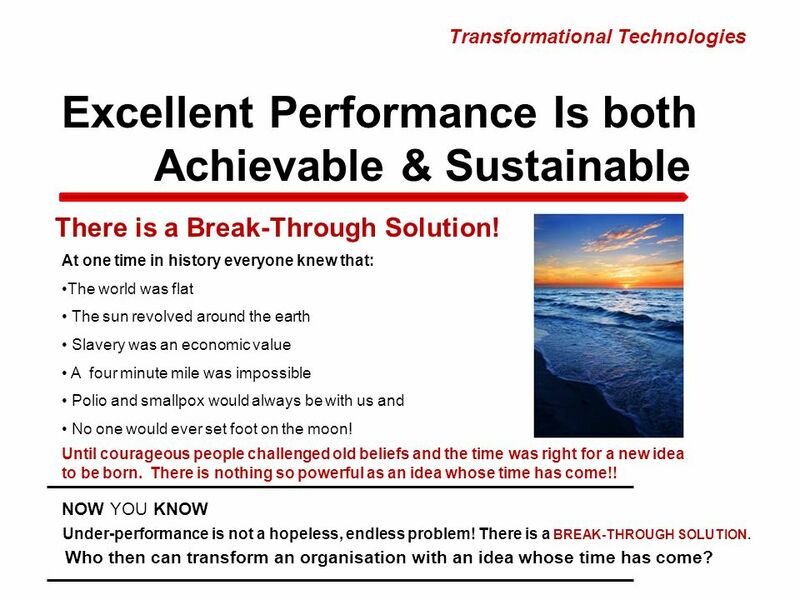 Mediocre performance often persists not because we cant end it but simply because we havent discovered a Break-Through Process! If there are more than sufficient resources? If the solutions are at hand? 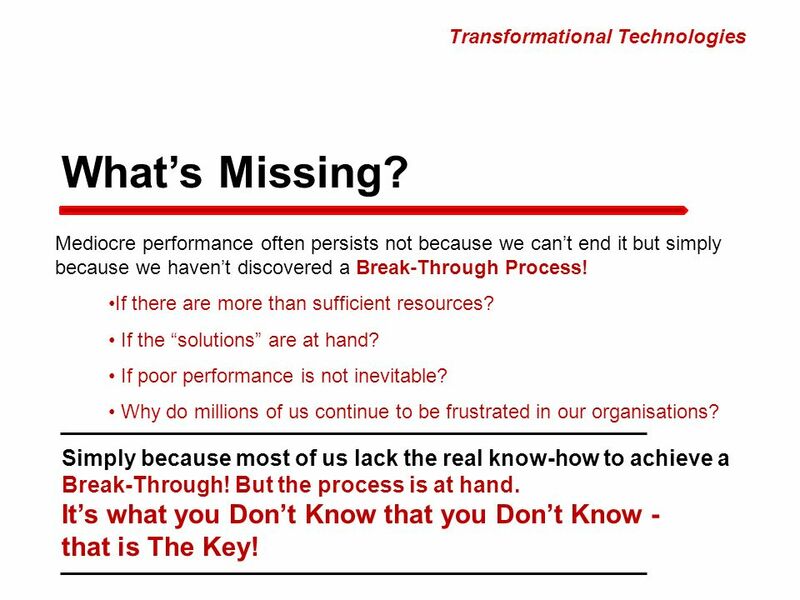 If poor performance is not inevitable? 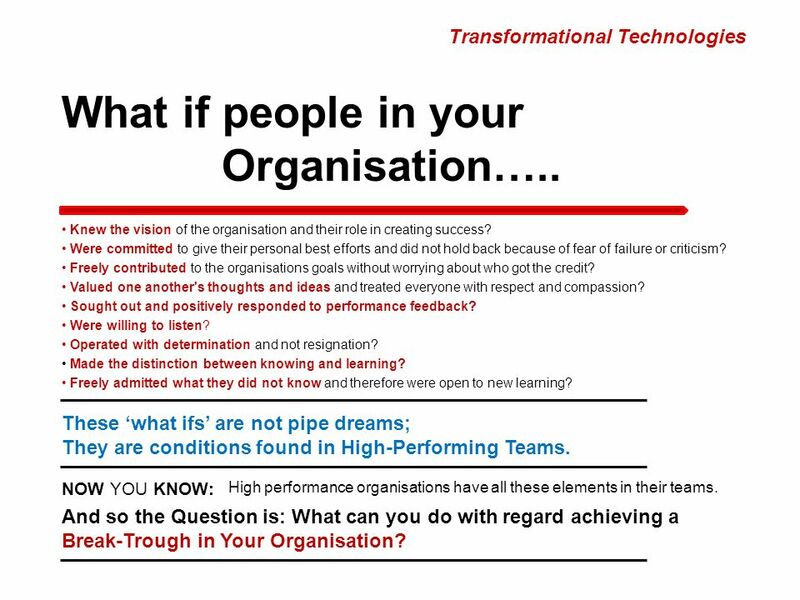 Why do millions of us continue to be frustrated in our organisations? 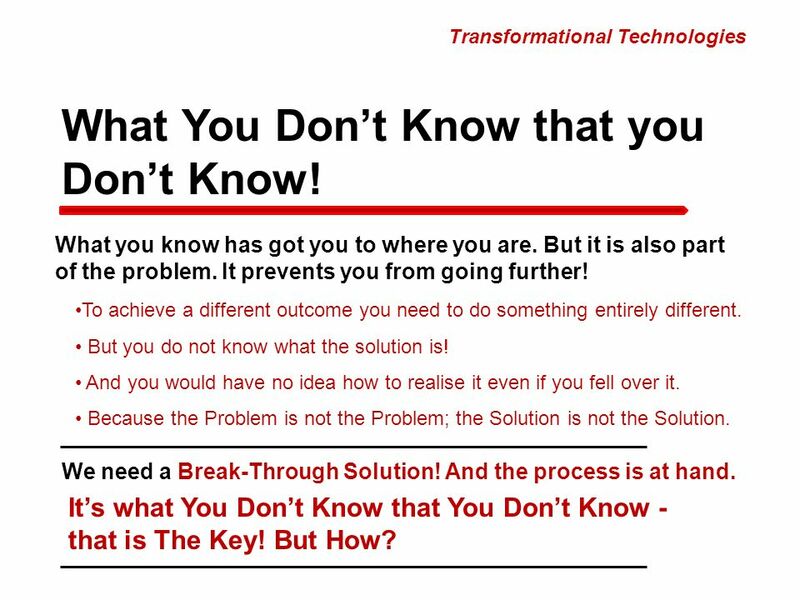 Simply because most of us lack the real know-how to achieve a Break-Through! But the process is at hand. 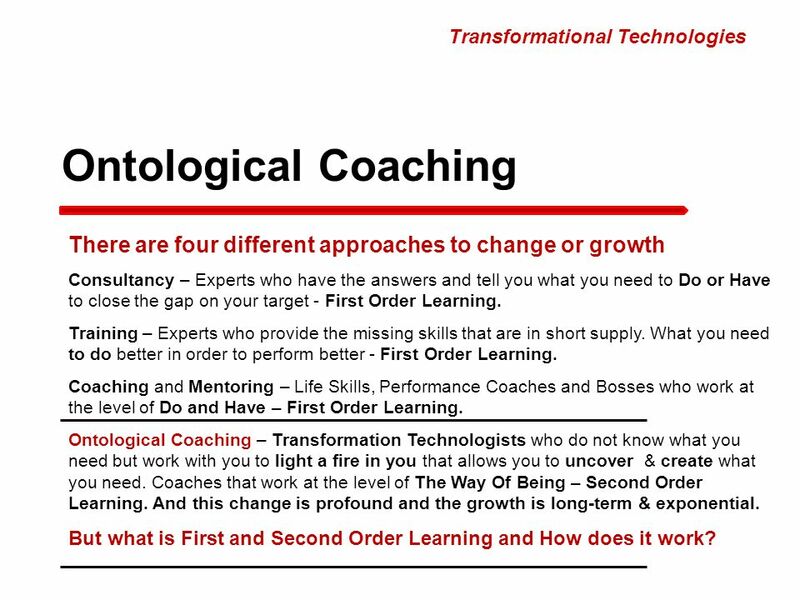 Transformational Technologies Its what you Dont Know that you Dont Know - that is The Key! 5 What You Dont Know that you Dont Know! What you know has got you to where you are. But it is also part of the problem. It prevents you from going further! To achieve a different outcome you need to do something entirely different. But you do not know what the solution is! And you would have no idea how to realise it even if you fell over it. Because the Problem is not the Problem; the Solution is not the Solution. We need a Break-Through Solution! And the process is at hand. 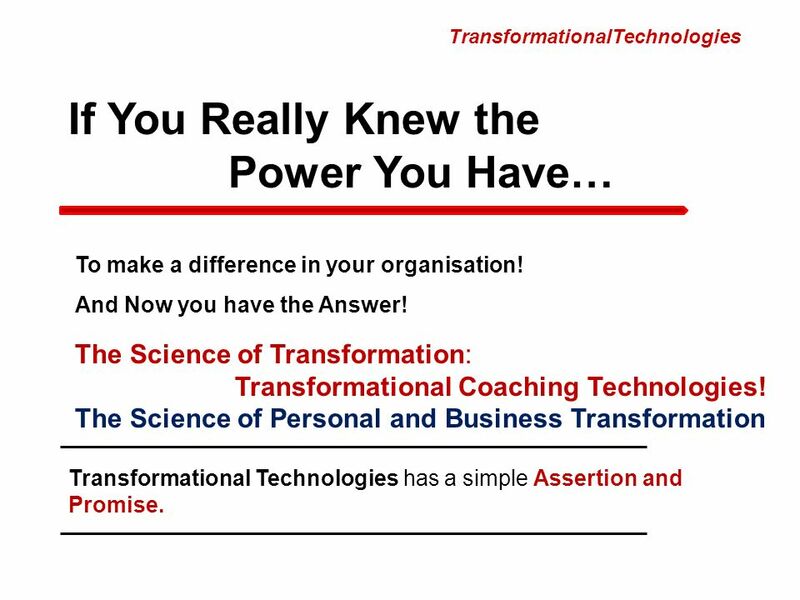 Transformational Technologies Its what You Dont Know that You Dont Know - that is The Key! But How? 17 Passion is the critical link between great ideas and great accomplishments. It is the X-factor that results in the sum of strategy and execution being greater than the parts. We must forget about trying to light fires under people. It is the fire in them that is critical to the success, even the survival, of todays organizations. 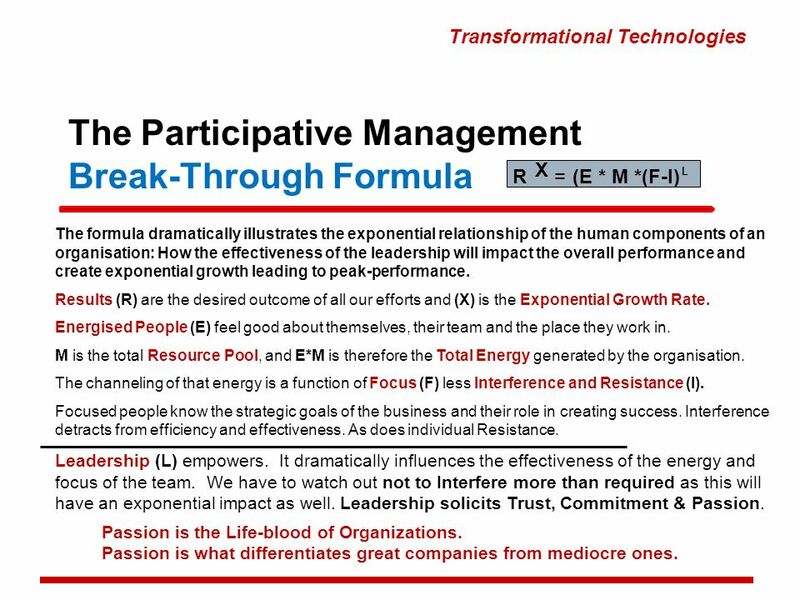 The Participative Management Break-Through Formula X (E * M *(F-I) L R = NOW YOU KNOW. 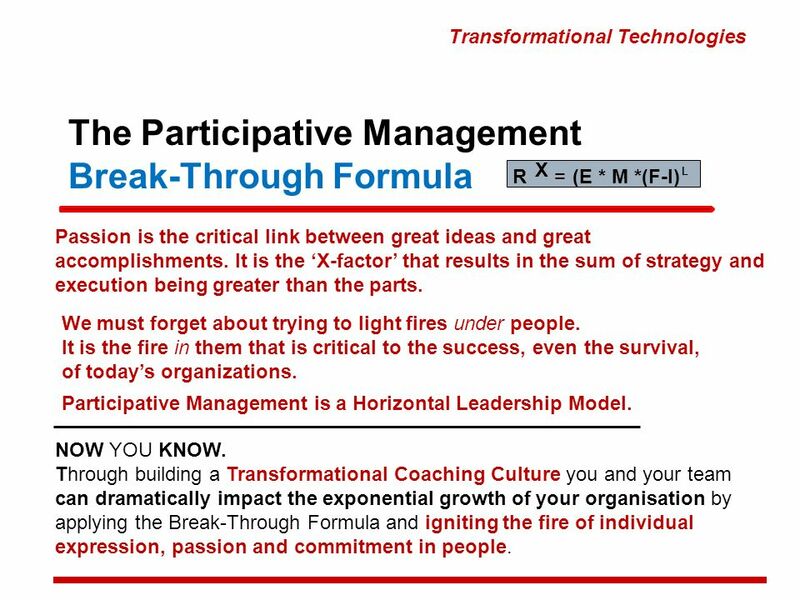 Through building a Transformational Coaching Culture you and your team can dramatically impact the exponential growth of your organisation by applying the Break-Through Formula and igniting the fire of individual expression, passion and commitment in people. 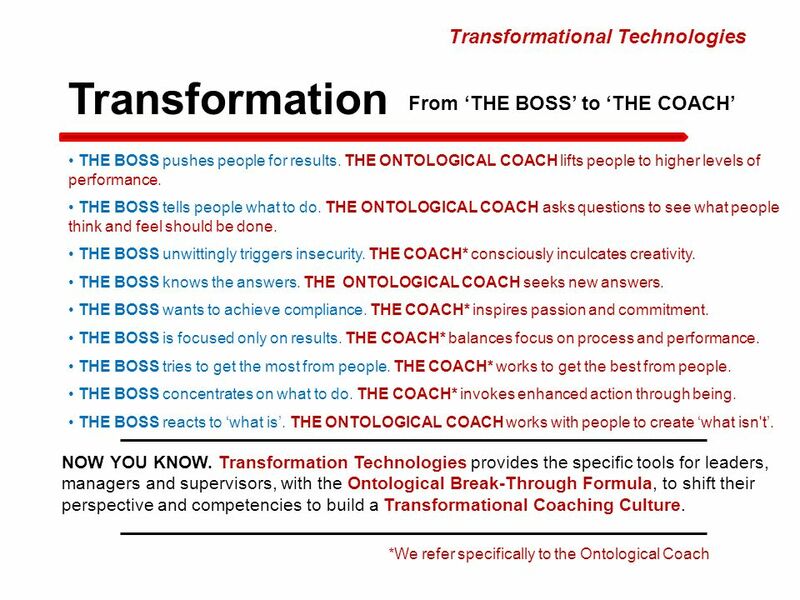 Transformational Technologies Participative Management is a Horizontal Leadership Model. 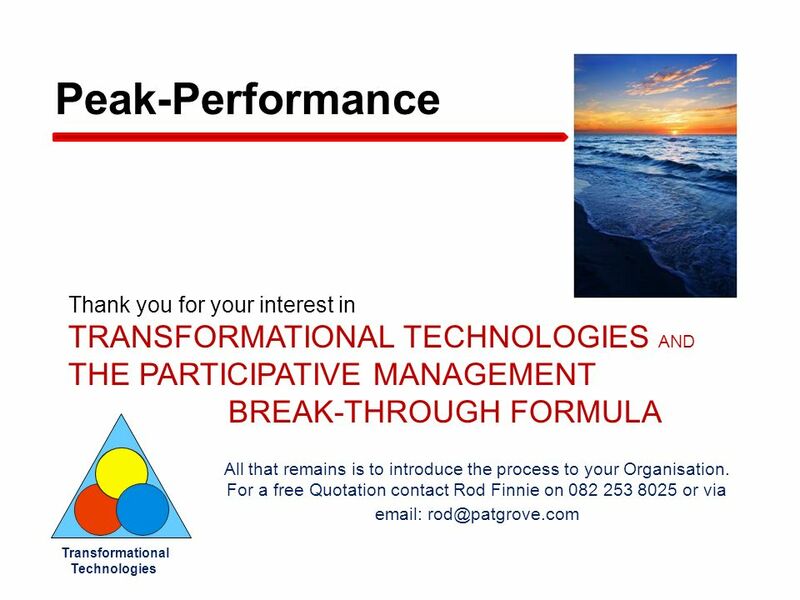 Download ppt "TECHNOLOGIES TRANSFORMATIONAL TECHNOLOGIES UNDER THE DIRECTION OF INTERNATIONAL MASTER-COACH: PAT GROVE Optimising Peak Performance Throughput & Fully." OneAll Solutions, LLC © 2014 Core Value Alignment— The Key to Passionate Engagement and High-Performing Project Teams June 10, 2014. 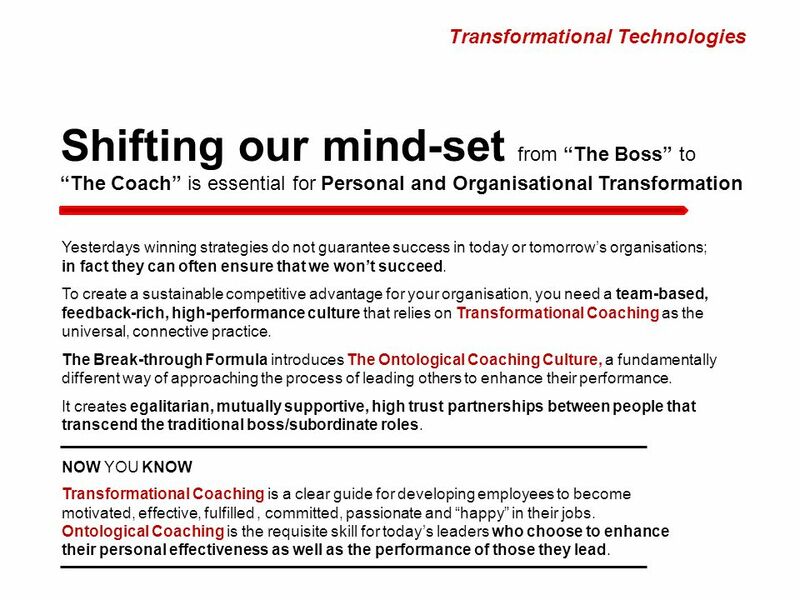 ©SWAN Consulting Key features of the programme: The Leadership Compass © is a series of three two day intensive leadership development seminars which are. 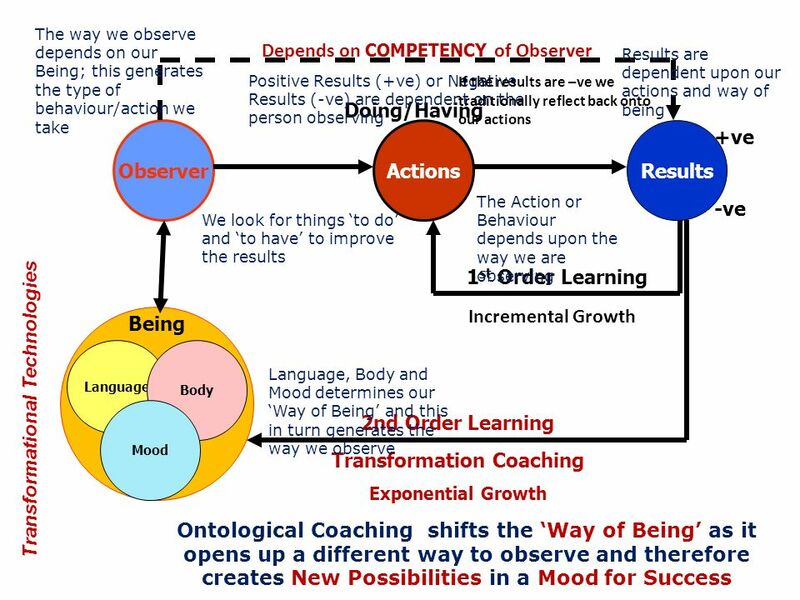 Code/Date © 2005 by Smiths Group: Proprietary Data Smiths Competency Model Strategic Decision Making Leading People Driving Results Commercial Orientation. Servant Leadership Week 3 WJ Patterson MGT 424 – Senior Seminar in Management. 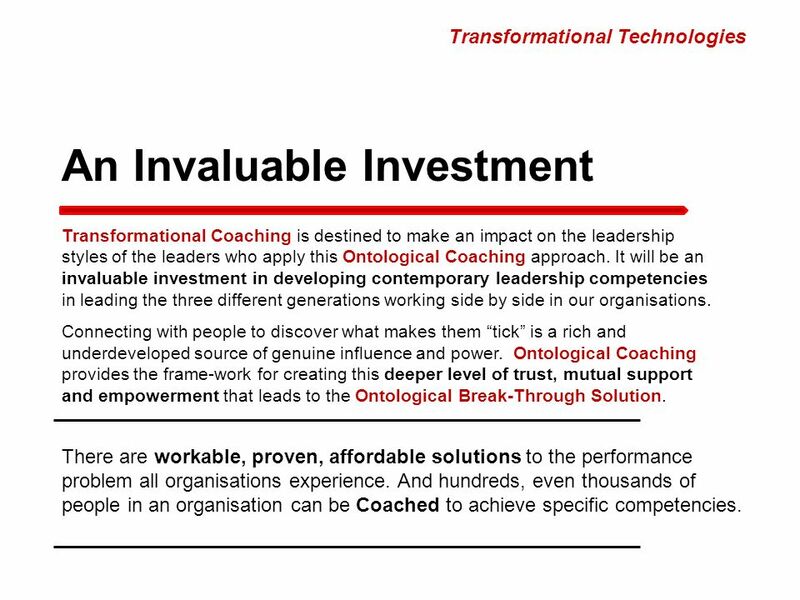 Confidential and Proprietary LEADERSHIP COACHING: Are You Maximizing Potential? December 2007.
International Plekhanov Conference Research of Successful Communications Planning; Team Restructuring. Aligning innovation to organizational strategy February 5, 2009 All materials © NetCentrics 2008 unless otherwise noted.